Maribor's Winery Water Tower. A place where only top Slovenian wines are served. For all wine lovers, Maribor is the place to be. Namely, as soon as you leave the city streets you will find yourself among beautiful vineyards offering breathtaking views. The influence of the wine tradition in Maribor is practically felt at every step. One of Maribor’s unique wine infrastructures, and also the first Slovenian winery offering only Slovenian wines, is the old historic water tower that stores wine bottles and represents a completely different type of wine store. 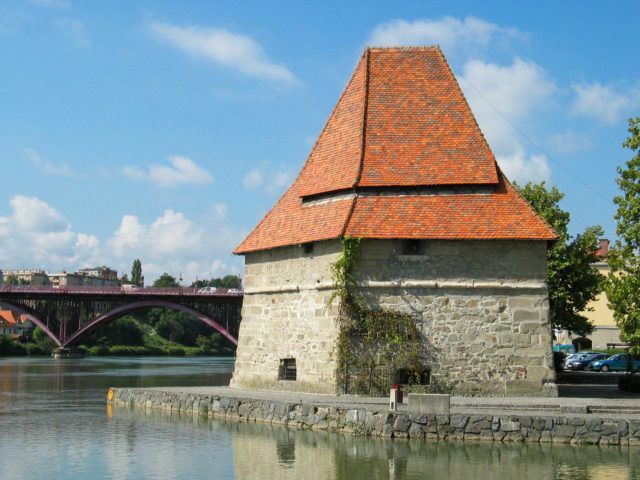 The Water Tower Winery (Vinoteka Vodni stolp) is situated on the left bank of the Drava river, in the heart of Maribor’s Old Town – Lent. The Water Tower has two floors – the ground floor was transformed into a modern winery, where everyone can find a wine variety suitable to their taste. The winery also offers individual or group wine tastings which is always complemented by the variety of snacks and dishes served at the spot to implement the wine tasting experience. The Water Tower is the meeting point of the past and the present, the past and the future. The visit of the winery is therefore inevitably tinged with history, tradition and cultural heritage. The water tower offers an amazing atmosphere so it is no wonder that the owners recognized the potential of the tower as a unique venue place for hosting smaller groups. Namely, on the top floor of the former bastion, where a round, in medieval style equipped hall is located, smaller groups are welcomed to organize banquets and wine tastings or even organize various cultural and social events such as concerts, exhibitions, lectures, screenings, seminars, etc.